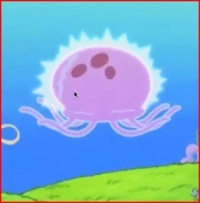 Glowing Three Spotted Jellyfish – From SpongePedia, the biggest SpongeBob-wiki in the world! A Glowing Three Spotted Jellyfish is a jellyfish SpongeBob says it a very rare species of Jellyfish. It just makes a Cameo Appearance in the episode: SpongeBob's Last Stand. After SpongeBob shows it to Patrick, Patrick tells him that he caught a "five-spot" which is really a one-spot. This page was last modified on 9 September 2014, at 12:27.